Iranian Foreign Minister Mohammad said that Russian, Iranian and Turkish efforts over the past five days have been successful in evacuating civilians from the Syrian city of Aleppo and facilitate the departure of militants. 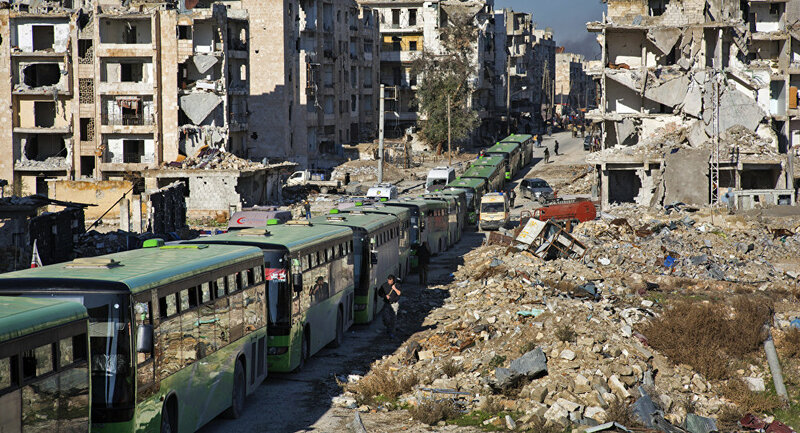 MOSCOW (Sputnik) – Russian, Iranian and Turkish efforts over the past five days have been successful in evacuating civilians from the Syrian city of Aleppo and facilitate the departure of militants, Iranian Foreign Minister Mohammad Javad Zarif said Tuesday. "We, you and Turkey have been able in the past five days to help evacuate innocent civilians from Aleppo, as well as [facilitate] the terrorist groups to leave the city," Zarif told Russian Foreign Minister Sergey Lavrov ahead of trilateral talks in Moscow.